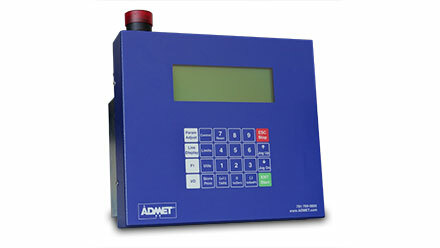 The ADMET DC1x Controller is a single-channel PID servo controller that provides AC, DC and quadrature encoder transducer conditioning, basic function generation, hydraulic pressure control, and a servo valve driver circuit. A four line display and 24 key tactile keypad provides an easy-to-use interface for creating test setups and adjusting control parameters during test. The DC1x includes a USB link to ADMET’s GaugeSafe software used for viewing and editing setups, viewing waveforms and peak/valley/cycle data real-time on a Windows based computer. The GaugeSafe software is included with each DC1x and also allows users to store waveform and peak/valley/cycle data to disk in ASCII delimited format for easy import into common spreadsheet programs. The DC1x controller is a cost-effective solution for basic cyclic fatigue testing applications. It is compatible with all ADMET servo-hydraulic and electro-mechanical dynamic test systems and can also be retrofitted to a wide variety of testing systems from other providers. Just have a quick question about the DC1x digital fatigue controller?